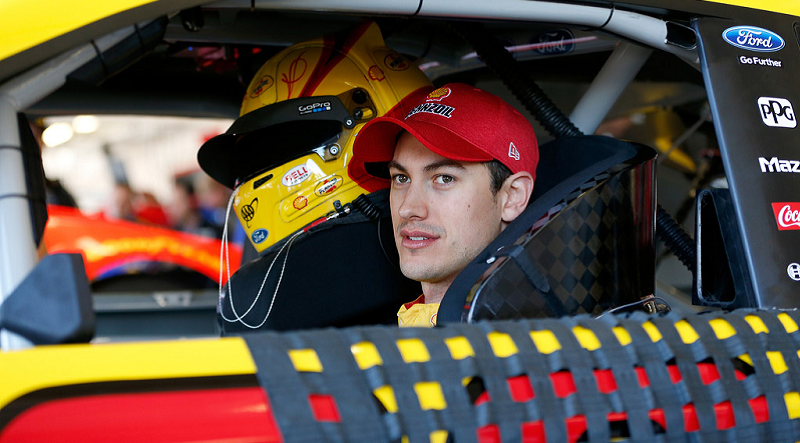 Joey Logano sits in his car during practice (Jonathan Ferrey/Getty Images North America). AVONDALE, Ariz. — Phoenix pole-sitter Joey Logano was quickest during final practice for Sunday’s Camping World 500. The Team Penske driver posted the fast lap of 26.719 seconds (134.736 mph) in his No. 22 Shell/Pennzoil Ford. Logano is also the most recent winner at Phoenix and got one step closer to making it two-in-a-row Friday by scoring the pole for Sunday’s race. 2002 Phoenix winner Matt Kenseth was second (134.519 mph) followed by Joe Gibbs Racing teammate Kyle Busch (134.399 mph). Atlanta winner Brad Keselowski (134.384 mph) was fourth and four-time Phoenix winner Jimmie Johnson (134.368 mph) slotted in the fifth spot. Erik Jones, Clint Bowyer, Kyle Larson, Martin Truex Jr., and Jamie McMurray rounded out the top-10. Chase Elliott was quickest in two of the three practice sessions this weekend at Phoenix this weekend but was 13th in Happy Hour while eight-time Phoenix winner Kevin Harvick was 16th. Daniel Suarez ran into some tough luck when the right-front tire went down on his No. 19 ARRIS Toyota which was the only stoppage of the session. The cars and stars of the Monster Energy NASCAR Cup Series will be back on track for Sunday’s Camping World 500 which begins shortly after 3:30 p.m. ET (12:30 p.m. PT) with live TV coverage on FOX.